Instructional librarians collaborate with faculty to help develop the academic research skills and confidence students need to successfully navigate the increasingly complex world of information. Your liaison librarian can work with you to help integrate information literacy objectives into your curricula, or provide one-off instructional sessions ranging from basic library orientation to advanced course-specific sessions tailored to the specific content of individual classes. Our instruction is informed by the Association of College & Research Libraries' (ACRL) Framework for Information Literacy. 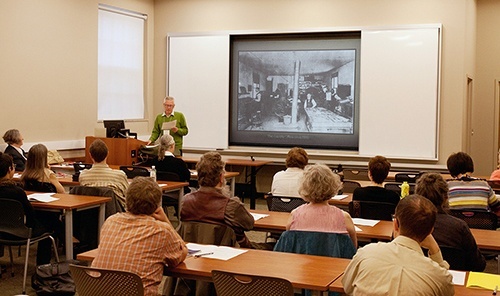 Library instruction can take a variety of forms: lectures, workshops, one-on-one meetings, or distance sessions held over web conferencing. For more information, please contact the liaison librarian for your subject area and campus. Library orientation sessions introduce first-year students to the library, and to the basic general techniques of library and information research. Individual students or groups are also welcome to contact us to book library tours. Advanced course-specific sessions provide students with in-depth instruction on the information sources and research skills most relevant to a course or to a particular assignment. These sessions typically can be arranged within your class schedule, and a hands-on workshop in a computer lab may be possible. For more information, please contact the appropriate liaison librarian for your subject area and campus. Library instruction that offers sequenced learning objectives and outcomes is the most effective method for lasting improvement in student research skills. We encourage you to contact your liaison librarian to discuss strategies for incorporating information literacy instruction in your courses. In the classroom, this can mean help designing library assignments, or grading library assignments written by your librarian. In the D2L environment, we can custom-design library modules for your course, or offer an active librarian presence in D2L discussion groups. Your liaison librarian will work with you to find the level of engagement that works best for your course. Librarians can also help you with your own teaching and research. The following list is just a sample of the types of assistance we routinely provide. Please contact the appropriate liaison librarian for your subject area and campus to learn more. We can help you build research skills development into course assignments and thus help you avoid some common assignment pitfalls that cause problems for students. You can also review our Creating Effective Library Assignments guide. Despite our collective efforts in helping students become good researchers, incidents of plagiarism do occur. UNB Libraries can educate your students about proper attribution and the broader principles of academic integrity. To learn more, contact your liaison librarian and see our Guide to Citation and Plagiarism. We can update you on the key article and research databases, current awareness services, or any other research tools that are important in your research area. In addition to booking an appointment with a librarian, basic individual help from both librarians and library assistants is available at each of the libraries' Help Desks. If a group of your colleagues are interested, we can visit a classroom in your department and provide you with updates on the newest electronic services and research tools which are most relevant to your specific field of research, department or Faculty. Contact your liaison librarian for more information. Talk to the appropriate liaison librarian for more information on integrating library resources or learn about existing library resource integration within D2L. Please contact your liaison librarian to arrange a session with our specialists.